There’s a new bar in town serving atas Chinese fusion food that is surprisingly wallet-friendly. 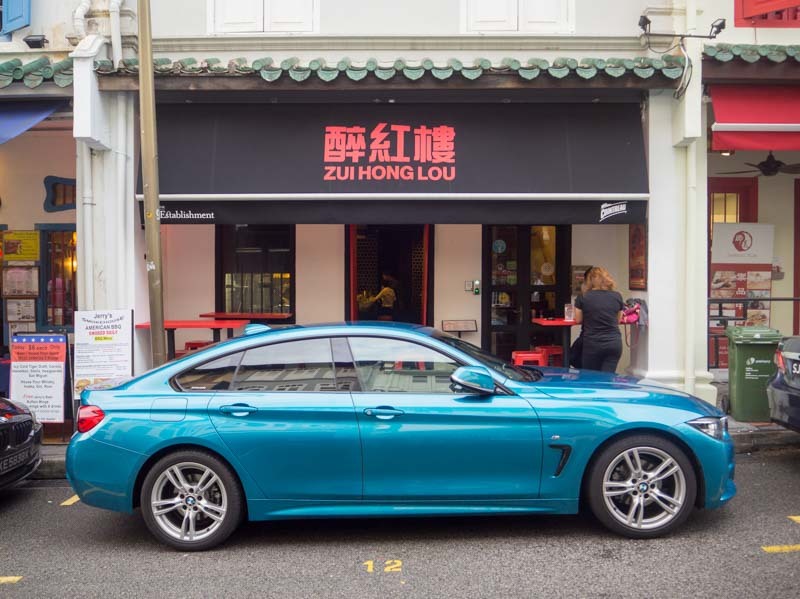 At 醉红楼 Zui Hong Lou, get ready for innovative cocktails, and the expansive food menu. Although its name translates as “drunken red house”, don’t let Zui Hong Lou’s raunchy name scare you off. Taking up shop beneath a quaint shophouse along Club Street, this bar fiercely embraces its Chinese-kitsch theme that will whisk you back to Singapore in the early 1900s. Of course, a bar’s ambience cannot be overstated. What I really love about Zui Hong Lou is its cosy, intimate setting that makes it favourable for conversation. In line with its Asian concept, the bar is decked with numerous maneki-neko good luck charms. 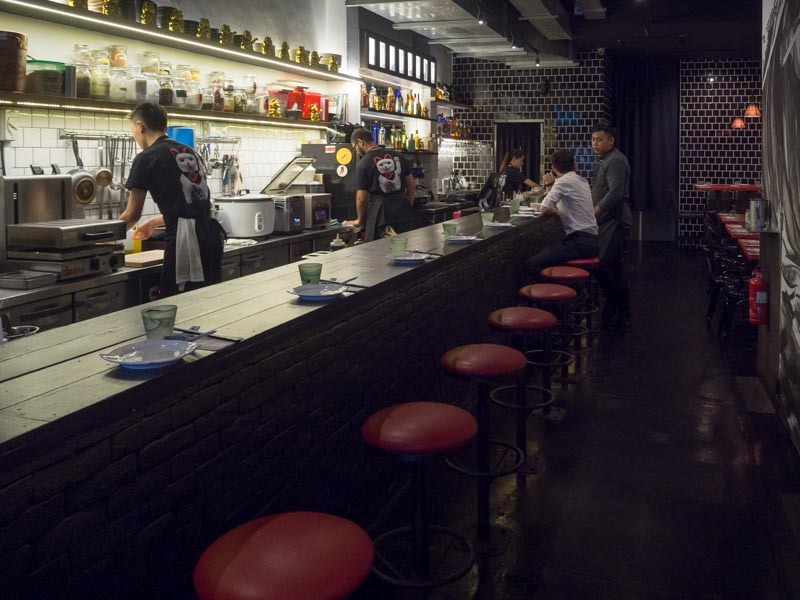 The menu at Zui Hong Lou is mostly Chinese fusion tapas or small plates. A must-try here is the baos, which comes in a few variations. While a ‘har kow’ bao may be tempting, the Braised Pork Belly ($9++) bao with deep-fried lotus root is the real show-stopper. 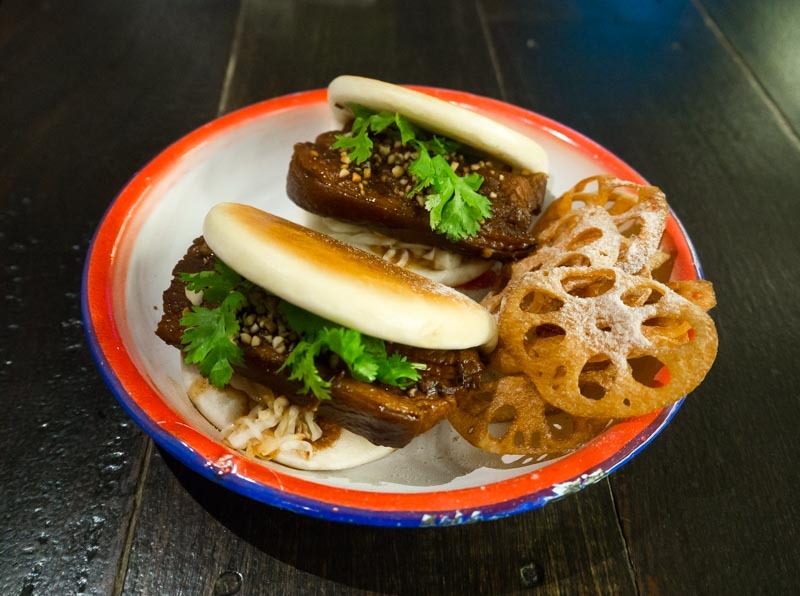 Reminiscent of kong bak bao, Zui Hong Lou’s rendition stands out for its fluffy pillow-like bao. The sous vide pork belly had a glorious melt-in-the-mouth tenderness. Chef Clement also put his own unique twist with the addition of peanuts to the sweet sauce that had a nice nutty aroma. At Zui Hong Lou, cocktails and Chinese food go hand-in-hand. 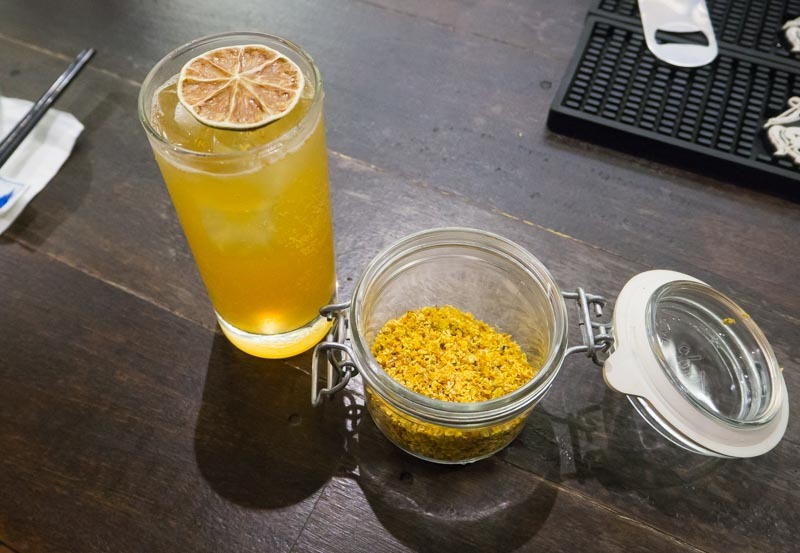 Start off your meal light with this refreshing Osmanthus Highball ($15++) made of rum and osmanthus honey. Brimming with bright floral accents, this cocktail was very easy on the tongue with a delicate sweet finish. 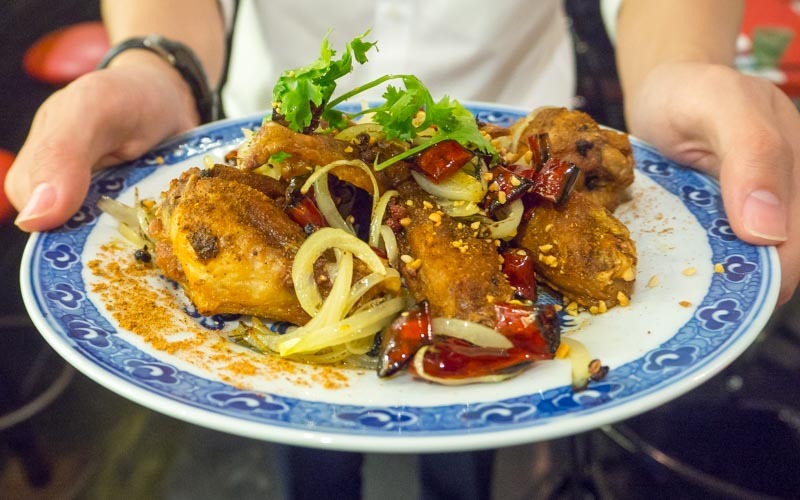 Brace yourself for Zui Hong Lou’s Chong Qing Wings ($10) that take chicken wings to new numbing and spicy levels. The spice kicked in the second the wings touched my lips. When I say hot, I really do mean HOT! The wings were so hot, yet so addictive that I couldn’t stop. The deep-fried skin was really crispy, while the wings were surprisingly not too oily. My only gripe with this dish is that it can get a little dry after gobbling down numerous wings. So worth it though! 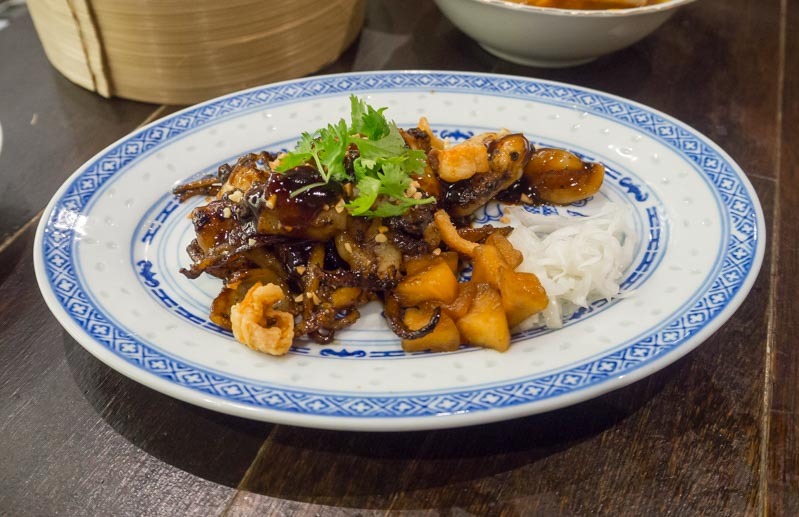 Another Chinese-inspired plate to get is the Kung Pow Baby Octopus ($8). While I found the kung pow gravy a little sweet, the grilled octopus was really tender and had a delicious smoky flavour. The caramelised apples also added a refreshing balance to the octopus dish. If you can’t get enough of the Chinese fusion ‘tapas’, the good news is that you can get more of them in the new menu! 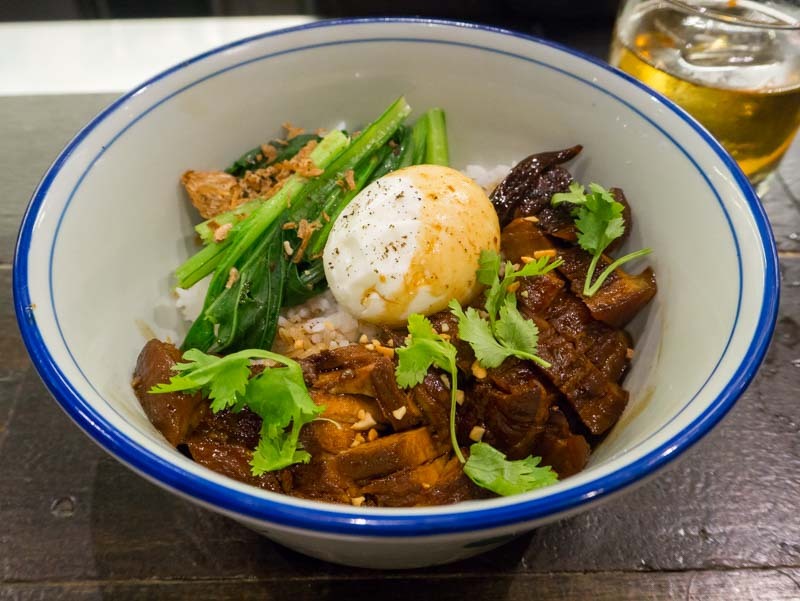 Zui Hong Lou has recently released its lunch menu with appetising rice bowl versions of their signature tapas dishes. 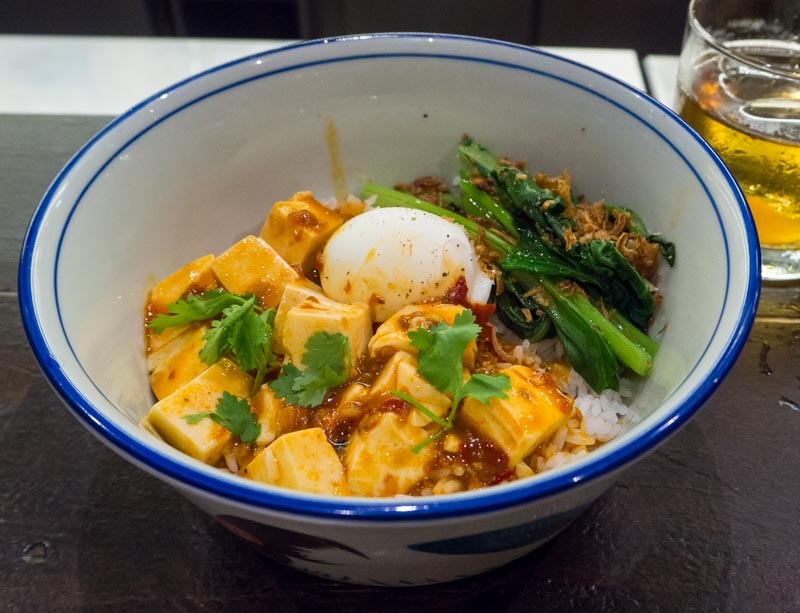 My personal favourite is the Ma Po Tofu Rice Bowl ($9++). The chilli sauce wasn’t too spicy and was filled with peanuts for a strong nutty taste. I recommend breaking up the poached egg and mixing the yolk in with the rice for more decadence. Cocktails are getting more creative, but a cocktail with lard? 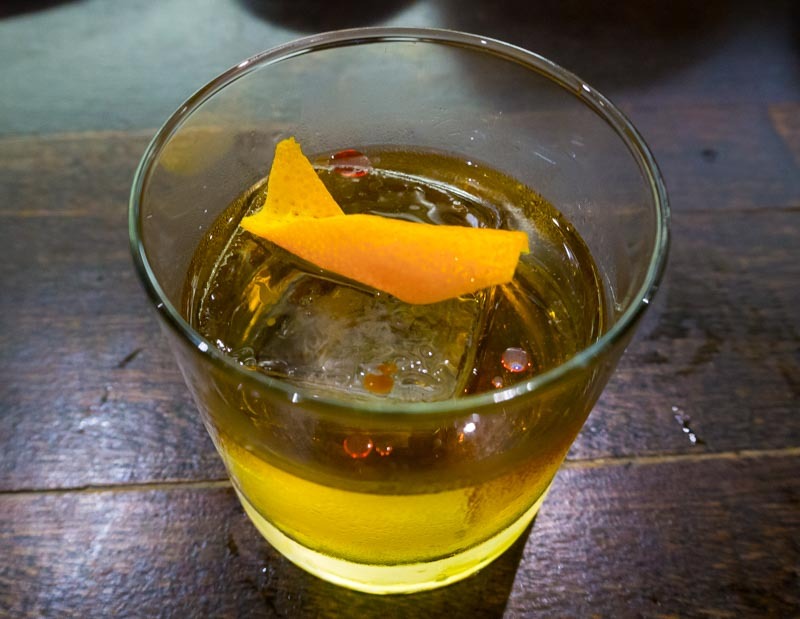 Zui Hong Lou’s “Not so Oily” Old Fashion ($16++) is a local-inspired rendition that features a bizarre lard fat-washed bourbon. The drink was quite strong, perfect for a devout alcoholic like me! This Old Fashioned takes it up a notch with an actual spiciness from a few drops of chilli oil in it! Don’t worry, the drink went down quite smoothly, and it was brightened with some bright notes of citrus. For a sweet ending, get Zui Hong Lou’s Peanut Paste Soup ($8). Unlike traditional tang yuan, the three deep-fried glutinous rice balls are served separately from the soup. 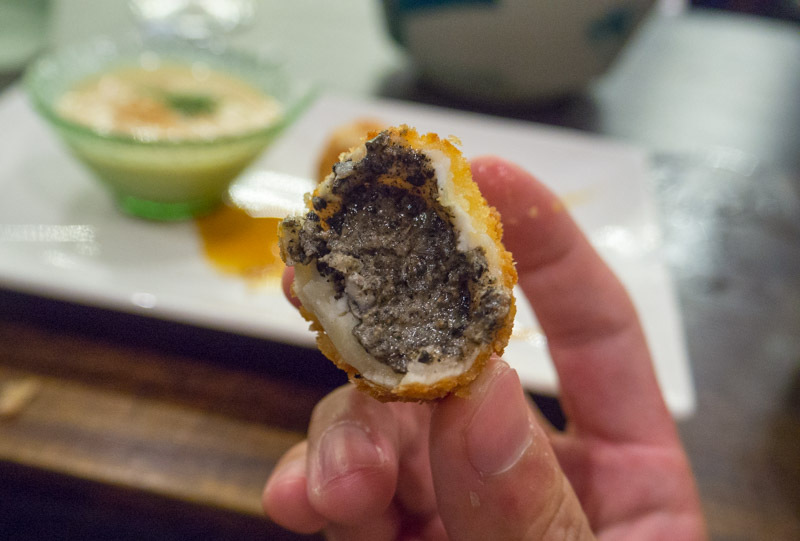 Just look at the thick black sesame paste! The rice balls had a strong nutty flavour and were not too sweet. However, their best feature was that the dough wasn’t too thick. 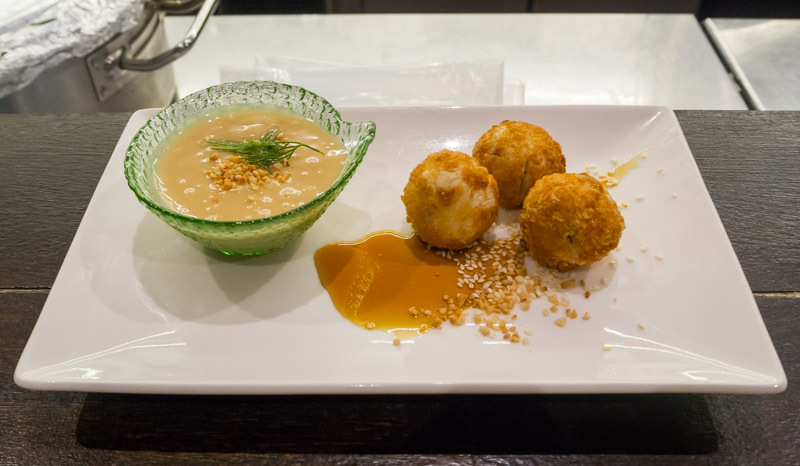 Dip the rice balls into the peanut paste to enjoy the dish at its best. Finish off your meal with this unique Singapore-inspired cocktail. 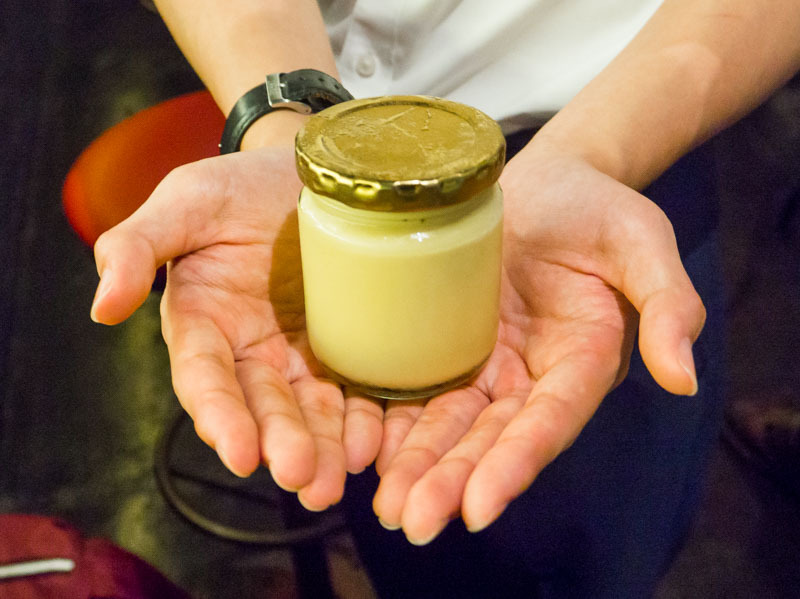 Called the Breakfast Club ($16++), this rum-based cocktail recreates the flavours of traditional Singaporean breakfast and is even served in a kaya jar. To mimic the flavours, the cocktail is filled with Averna-infused coffee, kaya oat milk, evaporated milk and egg yolk. The flavours went well together, resulting in a drink that’s sweet with a creamy consistency. This tasted exactly like (spiked) kaya! These Chinese-inspired dishes were very homey, yet bold enough to keep diners on their toes. What I really loved was that the tapas plates were well-portioned for their prices and perfect for sharing among friends. Of course, no bar experience is complete without boozy drinks. All the cocktails I had during the night hit the mark, even the more adventurous lard cocktail that had me worried initially. They also weren’t too exorbitantly priced either, at less than $20 per drink. I’m definitely going to keep Zui Hong Lou as an option when I decide where to go out with my homies on Friday nights!